This enchanting musical is based on C.S. Lewis' adventure story about four children of war-torn England, who accidentally enter the land of Narnia by climbing through a magic wardrobe. 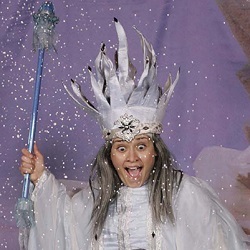 This strange and wondrous place is ruled by the cold-hearted White Witch, who makes the winter last year round. Although they seem unlikely saviors, the children fulfill an ancient prophecy by defeating the witch, thus restoring sunshine and peace to the spell-bound Narnia and returning the great Lion King Aslan to his throne. Theatreworks USA. Ages 5 - 12.